One of the more memorable promises Premier Clark made in the last election was the one of a debt-free BC (in 20 years or so). So it’s understandable that people are interested in what has happened to BC’s debt since then. Provincial debt has increased from $60.7 billion in 2013/2014 to an estimated $69.8 billion in 2017/2018 (total provincial debt). These are big numbers. But government budget figures always are. What really matters isn’t the absolute size of these numbers, but rather, how do these numbers compare to our ability to pay and whether those debts were accumulated for good reasons — were they wise investments? That’s why economists (and bond-rating agencies) aren’t particularly interested in the dollar value of a government’s deficit, bur rather, in the debt-to-GDP ratio (debt relative to the annual income of the economy) and in debt service costs (interest payments relative to the size of the budget). These are the figures we need to look at to get a meaningful picture of a government’s fiscal health. They capture whether a debt is comfortably manageable, or conversely, alert us if the debt becomes problematic. If debts are accumulated to improve the health of a society—to invest in education, to protect the environment and sustainably manage shared resource assets or to build needed infrastructure for many years to come—then they should rightly be seen as wise investments. That’s because these are all forms of spending that enhance the long-term productivity of a society and allow us to create more wealth in coming decades. Indeed, if a society fails to make such investments, it risks being much poorer over time. That’s why investing in poverty reduction, quality child care and early childhood education, more specialist teachers in the K-12 system, accessible post-secondary education, environmental stewardship and climate action makes good public policy. Failing to make these investments is a false economy. It may make the books look good today, but it sets us on a path of lower productivity, increased social ills and higher total costs over the long run. Commentators noting that BC’s debt is at “an historic high” are going for the shock value of reporting the debt in straight dollars, without noting that over time our economy and population have also grown. BC’s taxpayer-supported debt is projected to be about $43.3 billion in 2017/2018, but we are a wealthy province with an annual income (GDP) of well over $250 billion (projected to be $272.5 billion in 2017). That puts our debt-to-GDP ratio at about 16 per cent, and it is projected to stabilize over the next couple of years. It’s not an historic high yet it’s the envy of most other places in Canada as the charts below show. In fact, BC’s debt-to-GDP is the third lowest in Canada. When the debt carried by crown corporations like BC Hydro is added to the total, the provincial debt goes up to 25.6% of GDP and it’s forecast to slightly increase by 2019/2020 to 26.4%. According to the historical summary of BC’s total provincial debt in the 2016 BC Economic and Financial Review, the highest total provincial debt was under Premier Bill Bennett between 1983 and 1986 (just over 30 per cent of GDP). 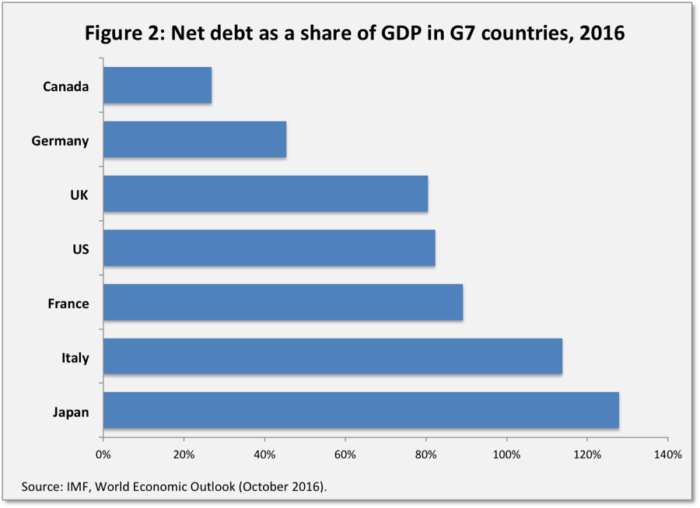 Canada’s fiscal position will remain the strongest in the G7, and it’s a little known fact that debt levels in Canada are among the lowest in the industrialized world. BC spends just 3.4 cents on interest for every dollar of government revenues (see Table 1.19 in the B.C. budget). If most of us were only spending 3.4 per cent of our personal incomes on debt interest, we’d be pretty happy! The average Canadian household spent 6.1 per cent of their income on paying debt interest in the third quarter of 2016 according to Statistics Canada, and the average BC household is now paying even more as we have the highest household debt in the country. Indeed, in the current environment of low interest rates on long-term government borrowing, now is an ideal time for the government to take on more debt in order to invest in improving the economic security and future productivity of British Columbians. Wise investors also compare the rates of return on different investments. That’s why it’s too simplistic to say that governments should prioritize eliminating deficits and paying down debt. Such a policy course needs to be compared with other options. At the household level, going into debt often makes sense, if, for example, it means building a rental suite that provides income over time, or investing in a child’s post-secondary education and thereby improving their lifetime earnings. The same logic holds for a government. Consider this: the rate of return on debt-reduction is the interest rate we pay on the debt (this is how much the province would save if we were to pay down a portion of the debt). The interest rates the province can get for its long-term debt are around 4 to 4.5%. In contrast, many public investments (such as spending on education) have higher rates of return than that, which makes them better candidates for government spending than paying off the debt. Backed into a corner by its own promises of debt-free BC, the provincial government recently decided to try to redirect the conversation to reducing operating debt only. Operating debt is the portion of debt that’s incurred when there is a budget deficit, that is to say when government revenues from taxes and other sources fall short of their annual spending commitments (for example, during a recession). However, focusing on operating debt misses the point. 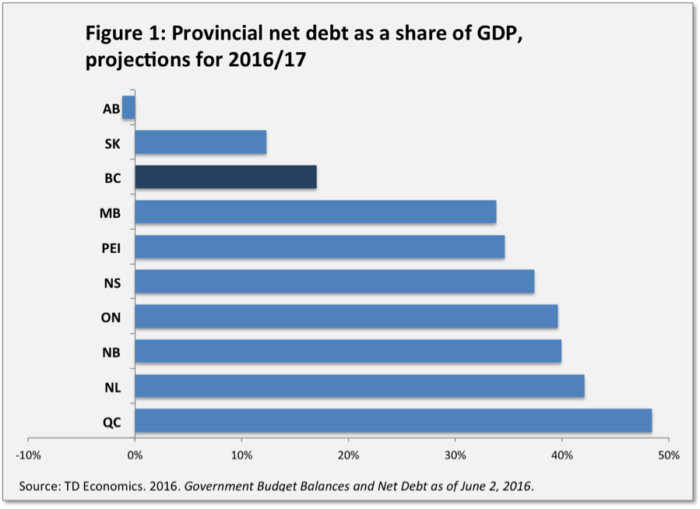 Recent increases in provincial debt have been driven much more by capital spending on infrastructure (hospitals, schools, roads and bridges) than by annual budget deficits. Running deficits during periods of economic slowdown is necessary to boost the economy and help families weather the economic storm. Once the economy picks up, government revenues increase and the deficits turn into surpluses. There’s no particular reason to rush to pay down the accumulated operating debt. 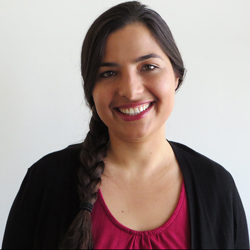 Doing so means resources are not available to make critical investments to help children growing up in poverty, youth struggling with mental illness or frail seniors stuck in a hospital longer than medically necessary simply because there’s not enough residential care beds or publicly funded home support hours. While taxpayer-supported debt is currently forecast at $43.3 billion, when the debt of “self-supported” Crown corporations is added, BC’s debt rises to $69.8 billion. However, not included in this figure (nor in the BC budget itself; only in the Public Accounts) is the huge ramp-up that has occurred in recent years under what the government calls “contractual obligations.” These now amount to over $101 billion. Omitting this from the BC budget represents a stunning lack of transparency. To be clear, many of these infrastructure projects were needed and worth doing. But doing them as P3s has inflated the long-term costs as we end up paying more in interest and in profits to these private “partners” (as CCPA’s Alex Hemingway explained here). And those liabilities should be clearly visible in the government’s books. But even with these long-term obligations, B.C.’s debt is still manageable. Most of those lease payments and contractual fees are spread out over 30-40 years. The ones carried by BC Hydro will certainly cause us all some headaches in the coming years, and will be a big reason for escalating Hydro rates for consumers. We will need to figure out how to pay for them in an equitable manner. But as a society, we can afford them. Given the social, economic and environmental challenges currently facing our province, a focus on paying off debt at the expense of strategic public investments is short-sighted. Our government’s credit rating is excellent, our debt level is manageable and there are a number of strategic public investments that will make British Columbians better off and improve our economy in the future. It’s the right thing to do. This post is updates our 2013 post, Assessing BC’s Fiscal Health: Can BC afford more deficits?